In the latter Quarter of the 17th and early Decades of the 18th Centuries. Welcome to the Pirate Brethren's Home Port. 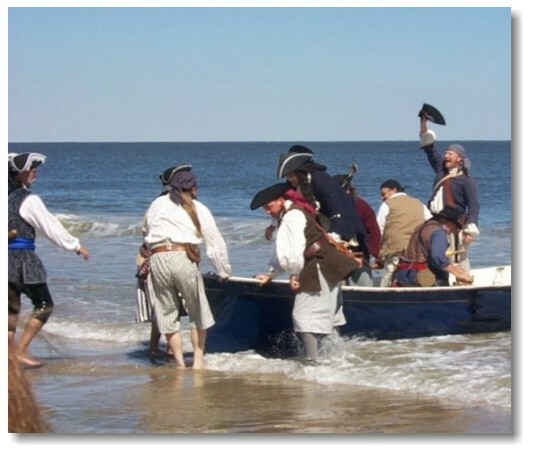 Herein you will find stories and lessons from the most experienced Golden Age of Piracy reenactors. The Pirate Brethren, as a reenacting group, was formed in the mid-1990s, originally going by the name Brethren of the Bay. We share a common ancestry with Merrick's Privateers, both units springing from an ill-fated attempt to have a Pirate Camp at Jamestown's Marching Through Time event, an idea which was in itself born of the annual Adelphi Mill Pyrate Feast. Our group is composed of experienced reenactors -- many with over twenty years of experience. As an experienced group, most of our members have either done or continue to do other time periods, ranging from ancient Rome to WWII 15th (Scottish) Recce, and almost everything in between. This interest in history has lead us to seek a more accurate portrayal of pirates -- pirates as common sailors, pirates as soldiers, and so on. It is important to note that this quest for accuracy in no way impedes our desire to have fun. It just means that our notion of fun, and who pirates really were, might be different than what you are used to seeing. If you find this historical approach to piracy appealing we are always looking for new members. No experience is needed, just a willingness to learn, an open mind and above all... a desire to HAVE FUN!